There are some colors in my closet that are not as dominant as others. One of them is green. I actually really like the color but I just don't own many items in that shade. The closest thing I had on me (that was also clean) was this neon sweater. Perhaps it's more of a neon yellow but I got away without being pinched on Sunday! Casual and laid back. In other (random) news, I'm obsessed with listening to Justin Timberlake's The 20/20 Experience. I cannot wait for the concert! Have you listened to it yet? Over it or obsessed? I wore zero green and didn't really celebrate st. pattys day... woops lol. 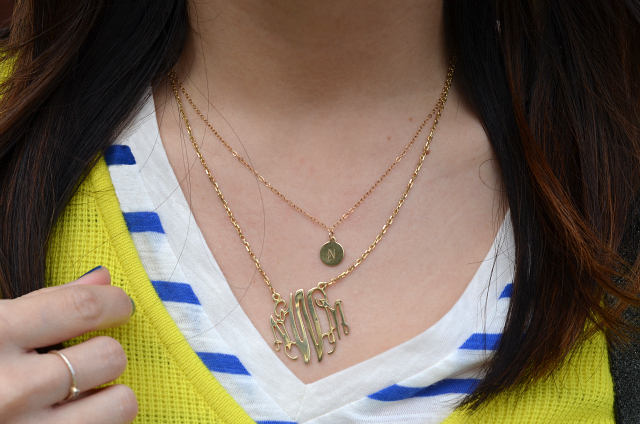 Love the layered necklaces here! Speaking of JT, so jealous you're seeing him in concert! Love your loafers and purple nails! Cute casual outfit! I have three items in my closet that are green Nancy! HaHaHa Fab sweater and love the striped shirt underneath. This colour looks so amazing on you!!! I love the striped top under the sweater. I haven't heard it yet, I should get on that! Lovely casual combo Nancy! I love the stripes and neon! There's nothing better than a bright pop of yellow. I love this sweater! 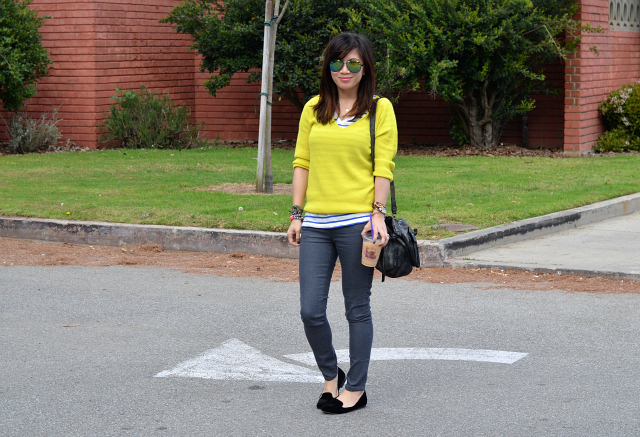 I like your yellow sweater over the stripped blue shirt .. very cool look. 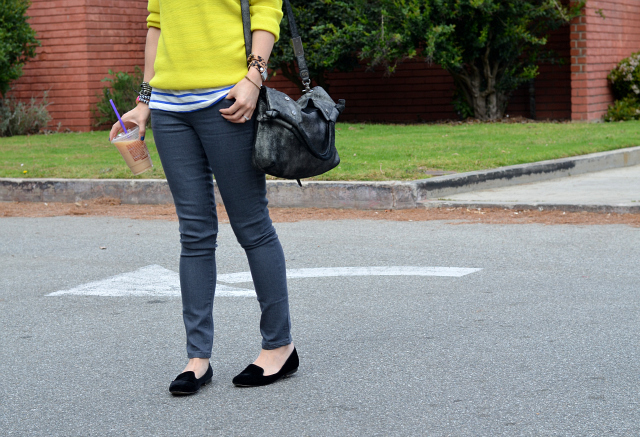 Love the layering and love the citrus colored sweater! Super cute! I am in love with your necklaces - so pretty Nancy! Very pretty outfit! I love those flats. My closet actually has too much green in it...haha. I am currently trying to add a little yellow. I think your sweater was a good replacement for the tradition green. Outfit is super cute, and love your shoes lady!! The only thing I wore that was green was my eye makeup over the weekend, ha!!! I like how I can see a bit of the stripes through the shirt. It's a cute and unexpected way to add a little somethin' to the outfit. I haven't heard of anyone who doesn't like JT's new album! My husband is obsessed. And when I told him that JT's William Rast line was at JCP, we went over the weekend and let's just say he was crazy. LOL. Justin Timberlake is awesome. I love green too but don't have ANY green things in my wardrobe - what is up with that? I love this little outfit here - it's comfy casual. ohh i LOVE your sunnies! i need a pair like that!! Love the neon sweater! I always feel like I can't pull this off due to my fair skin. You look great though! Perfect weekend outfit Nancy. The whole family wore green on Sunday and the leprechaun even visited our home to play a little trick on my son. Since my hubby is part Irish, we want to expose my son to his Chinese and Irish heritage. I haven't downloaded the new album yet - will probably end up doing it soon. I would love to see JT in concert! you did a very cute layering..yellow over stripey..i want it too!! 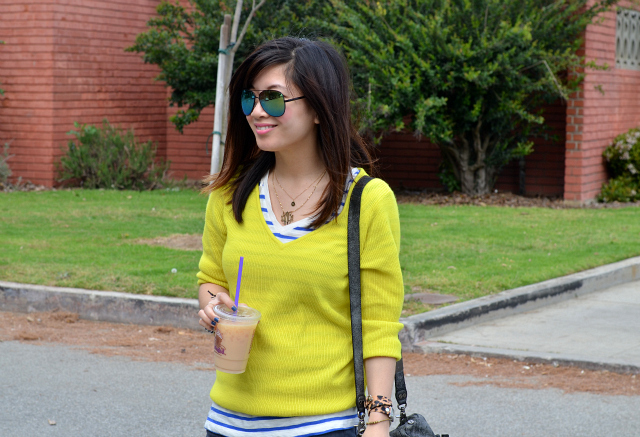 Cute idea to pair the chartreuse sweater with the blue stripes! What a great combo! Ha ha, well, it's sort of green! :) Either way, you look adorable. I'm starting to collect more green in my wardrobe, but I'm definitely lacking in reds. I only have one pair of shoes and one skirt. :) I LOVE, LOVE, LOVE JT but haven't heard his new album yet. I need to get it asap! Green or not, this outfit is so comfy and put together. I love every piece of it - I especially want your shoes and nail polish. I love the yellow sweater. I actually own more green items than orange items. Do like JT so I need to give the other songs on his album a listening to. When is he coming to the bay area?